Introducing the new Microlab low PIM jumper cables, JP/JR series. Microlab has launched a new product line: low PIM jumper cables, JP/JR series. These cables are available in stock in lengths of 1m (3ft) and other length are made to order. Microlab J-Cables have an operating frequency of DC to 3000 MHz; covering all common bands between 698 and 2,700 MHz. Despite the highly competitive price, J-cables encompass the full "Microlab CertifiedTM" quality. "RF cables are the backbone of any RF system and cable quality is paramount for network reliability and the best QoS", says Wolfgang Damm, Product Marketing Director for WTG. "Our new J-cables are especially designed with these requirements in mind. They are 100% tested to guarantee optimal system performance". The JP series are straight-to-straight N (m) cables; PR series are straight-to-right-angle N (m), ideal for low PIM connection in tight locations. These reliable, sheathed cables are especially constructed for low loss and low PIM. PIM performance is better than -150dBc typical, with -145 dBc guaranteed @ 1800 MHz. 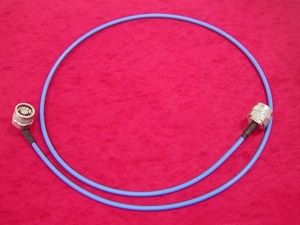 Microlab J-Cables are available for immediate delivery from Microlab and selected distributors.